Things aren’t looking good for Research in Motion. The Blackberry makers have failed to produce a viable smartphone competitor for the market year after year, and stock has continued tanking to new lows. With RIM’s stock reaching $13.44 per share, the total company value was at $7.04 billion as of last week. The App Store is worth $7.08 billion, making the entirety of RIM worth less than only one part of Apple’s business. 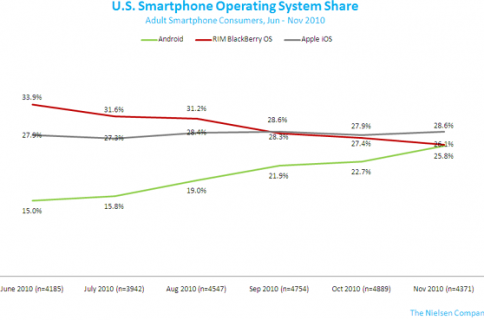 Apple’s own share value is more than 50x greater than RIM’s. Author Brian S. Hall notes that AAPL stock is worth $354 billion, and Apple’s App Store accounts for 2% of its company value. Do the math, and the App Store is worth $7.08 billion. That’s more than RIM’s entire $7.04 billion company value. RIM recently announced a dreary earnings report for the last quarter, and the company’s phones and tablets can’t seem to sell. The once-powerful player has lost its hold in the consumer market and is slowly losing its grip in the enterprise market. Both Apple and Google are making efforts to sell their mobile platforms to the business sector. 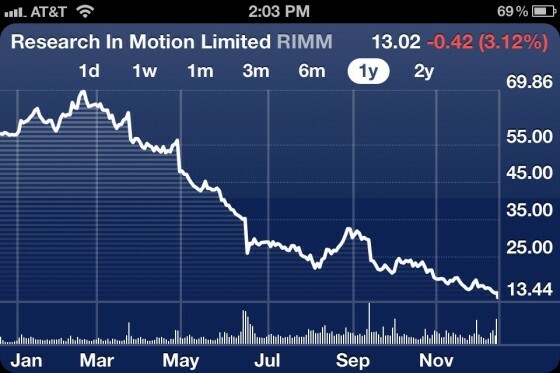 How much time does RIM have left? If the company cannot produce an appealing phone or tablet in 2012, there may be no hope.